Wayne Stolz is holding a silent auction of hockey collectibles for PMHA in honour of his late son, who owned the collectibles. Dec. 6, 2016 6:00 a.m.
Hockey collectors may want to clear their schedules this Sunday. A vast collection of cards and photos will be available in a silent auction at the Sandman Hotel from 9 a.m. to 5 p.m. through Yesterday’s Treasures Sports Memorabilia and Collectibles. 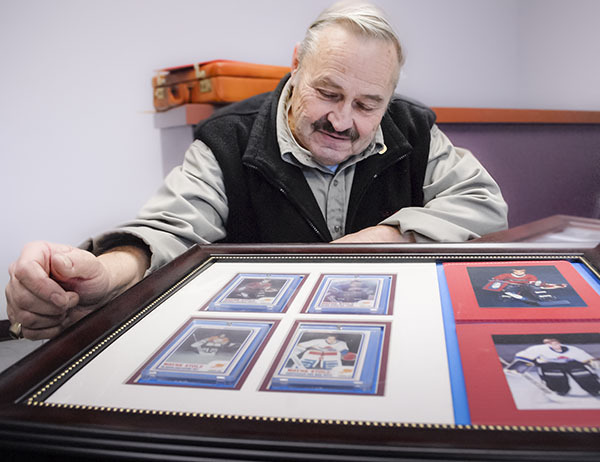 Wayne Stolz, owner of Yesterday’s Treasures Sports Memorabilia and Collectibles, will donate 40 per cent of the proceeds to the Penticton Minor Hockey Association. The items people can bid on include Bobby Orr Stanley Cup winning cards, a Wayne Gretzky 16×20 frame, Gordie Howe of the Detroit Red Wings, Dale Hawerchuck of the Winnipeg Jets as well as framed Original Six arenas and more. Stolz is doing it in honour of his late son, Wayne Paul Stolz, who died in a car accident on Feb. 14, 2002. Stolz played goal in the Kelowna and Castlegar Minor Hockey Associations. In total, 40 frames will be auctioned. Stolz also has signed cards of Okanagan Hockey Academy instructor Blake Wesley, who played 298 regular season games in the NHL with the Philadelphia Flyers, Hartford Whalers, Quebec Nordiques and the Toronto Maples Leafs. Stolz got the idea of selling the collection from a friend as they sat around talking about the collection and what he would do with it. His friend suggested auctioning them off and donating money to the hockey association. “This is very generous of Mr. Stolz,” said a Penticton Minor Hockey Association spokesperson. Along with the silent auction there will be door prizes available from various businesses, including a set of Penticton Vees tickets.